No two drummers are the same. And every musician has his own characteristic style. It is vital to obtain a sound that you are happy with: and that applies equally to the sound during a performance. But it can be expensive and time-consuming to find out what works and what doesn't. Enter: the TM-1, a unique trigger module that allows you to easily add more sounds to your acoustic drum set. And those sounds can be anything you want: the snare, tom, cymbal and percussion samples integrated in the TM-1, to your own samples and loops. 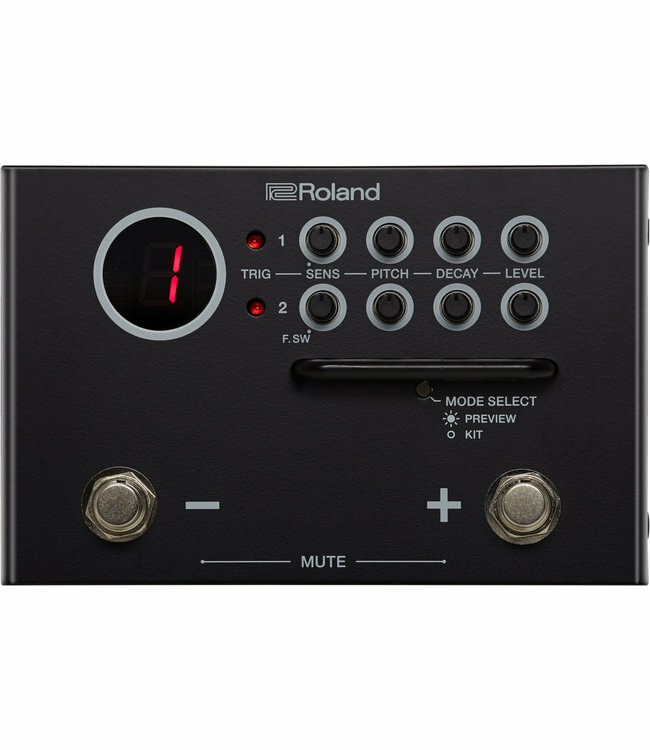 Simply connect a compatible Roland trigger pad to the TM-1 and immediately play the sounds you need. Or mount an RT-series trigger on one of your acoustic drums, and play on top of it with your favorite sample: in perfect sync and without any delay. With the free editor app for Mac / Windows and iOS / Android * it is a piece of cake to load your own sounds into the TM-1. Connect the TM-1 to your device, open the app, import samples from your library and adjust the settings as desired. With stage performances you can easily operate the TM-1, which can operate on both battery and mains power, with your foot via the built-in switches. It is even possible to mute the hybrid sound with a foot pedal, so that you can, for example, play completely acoustically in the stanzas, and provide extra hybrid power for the choruses. Every drummer nowadays benefits from a hybrid setup. And the TM-1 is the easiest and most affordable way to get started.